Thank you for considering donating to Universal Harvest. Your donation will help us support more people to prepare for today so that they can have a better hope of tomorrow. It will also enable us to bring together communities, provide lifelong advice on ways to overcome poverty and help us purchase more non-perishable and in-date food. A one-off donation with your debit/credit card, it is easy and secure. You can help us be effective today. You can setup a monthly donation online, it is simple and a secure way to not help us today, but make provisions every day. There is no charge to send the text. The only payment will be the donation itself which will be charged in your mobile bill, or deducted from your credit if on Pay As You Go. You can also add gift aid to your text donation to help us get the most from your donation. Or you can download the form below, fill it in and post to us and we can sort the rest out for you. If you have any questions about your donation, do have a read through our Donation FAQs below. 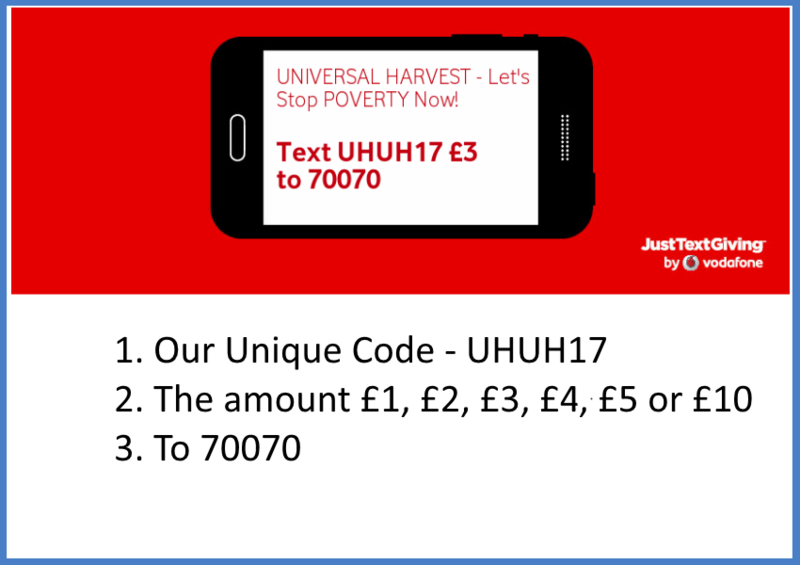 If you still need further information, please do not hesitate to contact our Donation Team on 0203 457 5728 or email us at donations@universalharvest.org. Where can I send a cheque donation? If you have signed up for our online / postal updates, you can contact our Administration team who will be happy to get this updated for you. You can also email donations@universalharvest.org or use our CONTACT US page with your latest details and we will update our system. We will send you an acknowledgement email to inform you this has been completed. How do I amend my regular donation? You can make changes to your regular donations via your bank or contact our Administration team and we can sort this out for you. Gift Aid is a simple scheme that allows charities to recover the tax already paid on donations made at no extra cost to you. By reclaiming tax from Her Majesty’s Revenue & Customs (HMRC), Gift Aid is a great way for you to help Universal Harvest maximise the value of your donations. That means that for every £1 you donate, it could be worth an extra 25 pence to us, totalling your contribution to £1.25p. How do I know my money won't end up in the wrong hands? We will continuously publish how much we are getting in donations and how we are using it. We are a non-profitable organisation and all the usage of our donations will be going towards the running of the charity and the provisions of the food items. You are more than happy to donate food items if you wish. Please contact us today to discuss this further. How do I know a fundraiser is genuinely raising funds for Universal Harvest? We plan to make a comment on all the events our supporters are hosting to raise funds for us. You can assure that if you see our comment, they have informed us and we are aware of the event. We do not accept cash donations; please use either our online, text, cheque or postal order options listed above. We are sad to hear that you have a complaint, but please do use our contact us page to submit your complaints and we will action this as soon as possible. Your complaints is just as important to us as your donations and we are just as eager to improve our services for the ease of our users. 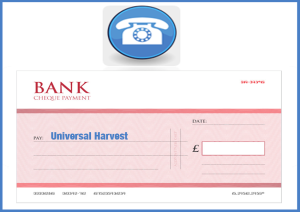 How do I cancel my donation to Universal Harvest? You can cancel your monthly donations with your bank. At the moment we are currently monitoring our administrative expenses which include the purchase of; stationery, stamps, telephone bills, office rent. We plan to use around 30% if not less of our supporters financial donations for administrative tasks. We will keep our supporters up to date on how we are utilising our donations. Can I make a donation in a foreign currency? Yes. If you’re sponsoring a fundraiser, you can choose to hide your name and/or donation amount on their fundraising page. However, MyDonate will still need to pass your details onto us so we can accept your donation (and Gift Aid where appropriate). We can only use your details if you give us permission. I’d like to fundraise online, how can I do this? 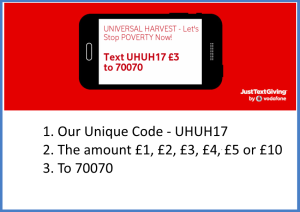 Please visit the MyDonate website: https://mydonate.bt.com/charities/universalharvest for further instructions on how to create your own fund raising page. Or you are happy to use other online donation platforms and send us how much you raise. We will only use your details for sending you our latest information on what are doing, campaigns we are running and the outcome of the work we are carrying out. If you do not wish for us to do is, please just inform us and we will remove your details from our system. Will I receive an acknowledgement of my donation? It is very important that we say thank you for every donation regardless the amount. You will receive a thank you message from us for every donation you make. Is setting up a Direct Debit online secure? Our online donation is setup with BT’s MyDonate online services. BT is one of the world’s leading experts in online security. Who are trusted by security-conscious organisations including high-street banks and the UK government. I have more questions – how do I contact you? 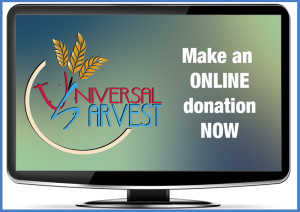 Please use our CONTACT US page for details on how you can reach us, or email us at donations@universalharvest.org.